This summer, two young farmers have set off on a journey of all terrains, making their way from the UK to Mongolia in the name of charity. The rules of the Mongol rally are simple - to cross the desert and mountainous grounds between Europe and Asia and do so in a 1 litre vehicle you bought for under £10 at the scrap yard, all while raising at least £1,000 for your chosen charity. For young farmers Jonathan Glen, 23 and Alan Walker, 24, the task at hand is all in aid of raising awareness about mental health issues within farming while undergoing their own personal challenge. Neither come from farming backgrounds and found themselves friends after starting at Harper Adams University together. Jonathan’s interest in farming stemmed from time on his uncle’s dairy farm in Ireland and Alan’s was inspired from an agricultural class at school. “We wanted to do something out of the ordinary together and see if we could make a difference," explains Jonathan. The route is anything but easy and participants normally head for Prague first to the general launch party. Typically, teams then veer towards Moscow, Kiev and Istanbul or, for those taking the Ukraine/Russia route, they head to Uzbekistan before making the run for north-east Mongolia. For Jonathan, this not only gives him the chance to pursue his love for travel further, but the opportunity to spend some quality time with his best friend before life after university sends them opposite ways. It also gives him his moment to highlight mental health, a subject close to his heart. After suffering with depression himself, Jonathan is keen to raise awareness about the topic and has chosen The Farming Community Network (FCN) as his charity of choice. Believing its severely overlooked within the industry, participating in such a renowned event will, in his eyes, only promote how important it is for those in rural communities to talk about their mental health. “There have been years of campaigning for good physical health and for health and safety within farming but one crucial element has been forgotten. “The figures on suicide in our industry talk for themselves. “Due to our lifestyle, social expectations, finances and commitment to the land, there is a unique kind of pressure on farmers. Having travelled to New Zealand to learn more about farming and dealing with his own issues, Jonathan can understand first-hand what effect mental health can have on you and others around you, especially when the feeling of isolation sets in. But he is passionate about developing the understanding within rural communities. “I love farming and feel I am invested in the community. “As someone who has suffered from depression while farming I have an appreciative and empathetic view on what a lot of us in the agricultural industry go through”, he says. Over the years, Jonathan says he has found various ways to deal with anxiety and depression but it was only through opening up to others that he began to start helping himself. The drive will take the two friends through Southern Russia and as an extra challenge, Jonathan will be making the drive home too. 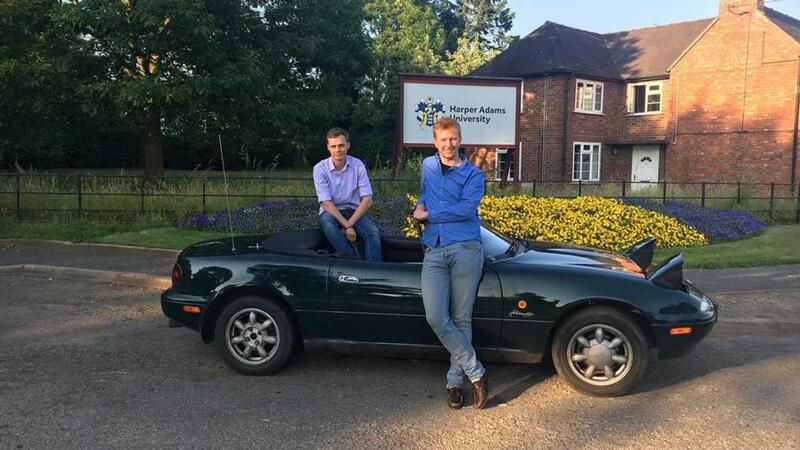 It is easy to understand why people might perhaps be a little apprehensive about their trip - especially as their taking on the gruelling 15,000-mile task in a 22-year-old refurbished Mazda MX-5. “The reaction goes through many stages," says Jonathan. “Firstly, one of disbelief. Then more so when they find out that I will be driving 5,500 miles on my own to get back to the UK. “In terms of the cause, I have had nothing but positive feedback. They are hoping to raise £5,000 for the FCN along with a further £500 for Kettering General Hospital, where Alan’s Grandmother recovered from cancer. “In the UK, more than one farmer a week takes their own life. The feedback Jonathan has had from this has no doubt spurred the pair on to do the best they can. But he is passionate about sustaining support for those with mental health further and plans to do much more fundraising events in the future to continue to raise awareness for the cause. He also wants to urge anyone currently suffering, not to do so alone. “For me, the first step was confiding in people who I know and trust. It was only recently I told my parents, so find someone who you can talk to," says Jonathan. “Reach out to those who can genuinely provide help, like the FCN, but also take time to understand what is going on, what has helped other people and while it is hard to take a moment of reprieve by yourself each day, do take a step back, and marvel in the world around you. “This of course relies on self-awareness and metacognition which is not something that comes naturally to everyone. “I would also urge the agricultural community to keep an eye for those who are at risk and don’t overlook those small changes in someone’s demeanour. The rally began on July 15, and will cover 22 countries in just eight weeks.